I came across the photo below yesterday and thought I’d share it here. It seems the picture was an online entry in a trailcam photo contest. The photo shows a nice buck all bowed up in a defensive posture as a very large, and very dark, cat eyes him menacingly. According to the information on the photo, it was taken in December of 2007. The site said the photo was taken near Tenaha in deep East Texas. I see nothing in the photo to make me believe it is not legitimate. The one problem I have with the photo is the claim it was taken near Tenaha. I’m from deep East Texas and this doesn’t look like that area to me. The dirt in that part of the world is a deep reddish-orange (due to high iron content). Also, Tenaha sits in the Piney Woods region of Texas. There’s nary a pine tree to be seen in this photo. These are hardwood trees that have dropped their leaves. Certainly, there are areas where hardwoods grow in that area but the fact that there is not a single pine present really makes me believe we are not looking at East Texas. Even if the location is incorrect, we should not lose sight of what is important here. In the big picture, what matters is WHAT we are looking at and not so much where the photo was taken. Don’t get me wrong, the location is important. I’d certainly want to know if a cat that size was on my property, but the critical factor here is the size and dark coloration of the cat. 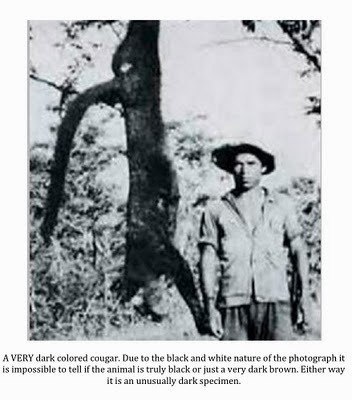 Remember, according to wildlife officials, there is no such thing as a “black panther” anywhere in the United States. 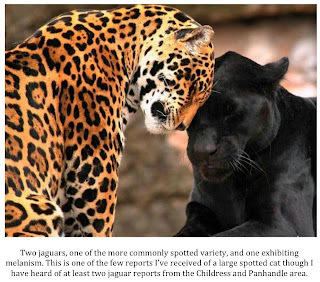 Jaguars, which do exhibit melanism on occasion, rarely cross our southern border (though sightings in Arizona and New Mexico are becoming more common) and there is not a single documented incident of a melanistic mountain lion. These facts are what make this picture so interesting. There aren’t supposed to be black, or very dark, cougars out there. This is, at least in my opinion, clearly a cougar. I think you can plainly see that in the zoomed in and cropped photo below showing a close-up of the head of the cat. If so, it is an unusually dark specimen. To be sure, there are many variations in the shades of coat colors on mountain lions. Some are darker than others. The time of year, no doubt, also comes into play. Maybe the thicker winter coat this cat would be sporting in December is darker than the lighter summer coat. 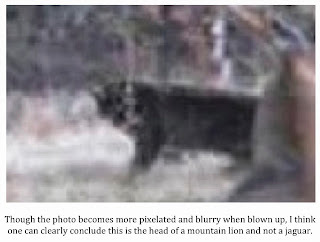 Speculative to be sure, but there is no arguing that, if this is a mountain lion, it is an unusually dark specimen. Could lions like this be the culprits responsible for the multitude of black panther reports in Texas and other parts of the U.S.? Certainly, it wouldn’t be too much of a stretch to think a witness would describe the cat pictured as a black panther. Maybe the question that should be asked is, if cougars can get this dark, could they get darker still? If so, then we have a prime suspect in our ongoing black panther mystery. Personally, I don’t think dark cougars can completely explain the black panther phenomenon. Though they may not be as rare as previously thought, mountain lions this dark are few and far between. Dark colored lions may be out there but I think there has to be another component to the mystery considering the number of sightings reported annually. Just what that other component might be is anyone’s guess. Below are the latest handful of black panther reports I’ve received since the beginning of the year. I've received fewer reports than usual over the last three months or so but I suspect it is due to the harsh winter we've had here in Texas. Readers from the northeast may get a chuckle out of that statement but, by Texas standards at least, it has been a really tough winter in the Lone Star State. People have been inside more than usual and wildlife has been hunkered down in the warmest spots they can find. Now that spring is beginning to show its face, I am expecting black cat reports to pick up. As always, I cannot vouch for the veracity of the accounts below. Most of them have come in as comments to blog posts with the commenter remaining anonymous. That being the case, I can’t make secondary contact. It is possible that some sighting reports are the work of hoaxers but I have diligently weeded out those that seem “shady” and printed only those that seem reasonable and credible. The original reports are in italics and are followed by my comments. "Hello, I recently moved to a community NE of Mckinney, TX in Collin County. I saw what I believe to be a black panther walking in the woods along the creek behind our house. It looked like it had a 3ft tail and body w/tail about 6ft. It was in the shadows of the trees & I did not see any spots. We live in a new community w/ mostly vacant lots, woods, and lakes. The person across the street said he saw one over a year ago. I'm afraid for our dog. Can they be caught and relocated? You are welcome to put up a camera." TCH Comments: McKinney is a suburb of Dallas and sits just north of another bedroom community, Plano. This area has been the source of a surprisingly large number of black panther reports. McKinney sits between two large reservoirs, Lake Lewisville and Lavon Lake. While a satellite of Dallas, the area gets surprisingly rural very quickly. As far as trapping and relocating a big cat, it would take someone more qualified than I but I suspect it would be all but impossible. While this witness offered to let me put up cameras, the account was submitted as an anonymous comment to another post. That being the case, I can't get in touch with this witness. If the reader who submitted this report happens to see this, please contact me via email at Texascryptidhunter@yahoo.com and we can discuss placing a camera or two on your property. "I was walking with my two German Shepherds out in my back pasture one morning about 7:oo in January of this year~2014, when my male shepherd came to a quick stop and stood watching something about 50 yards ahead of us. When I looked up I saw a dark colored cat about 30 pounds or so, leap about 10 feet up into a tree covered with thick brush and was gone, it had a long tail. this was off FM 414 in Cleburne, TX. Not sure what it was but a neighbor up the road said his wife had a picture that she had taken earlier." TCH Comments: Cleburne sits roughly 30 miles south of Fort Worth and halfway between Glen Rose and Waxahachie. This particular area has yielded fewer reports than the areas north and east of the Metroplex but is not devoid of accounts. The area is rural and there is plenty of room for a large cat to hide. This witness estimates the black cat he saw to be about 30 lbs. Could this be a juvenile? The size also makes a jaguarundi in black-phase a possibility. While the jaguarundi is a known species, finding one in north-central Texas would be quite a story as they are not thought to live too far north of the Rio Grande valley. They are very rare even there. I'd like to know if this witness remembers anything about the head of the cat as jaguarundis have a unique appearance. I suppose a large feral cat is a possibility as well if the witness was just a bit off on the heavy side in his weight estimate. "I have seen a spotted cat in Texas. I have seen it almost every day for about 2 weeks then it was gone. As I have looked into big cats, I found out they move around as the food does and I know that what I saw was a jag and they have been seen here for over the last 75 years as I talk to the old cowboys around Quanah, Texas." 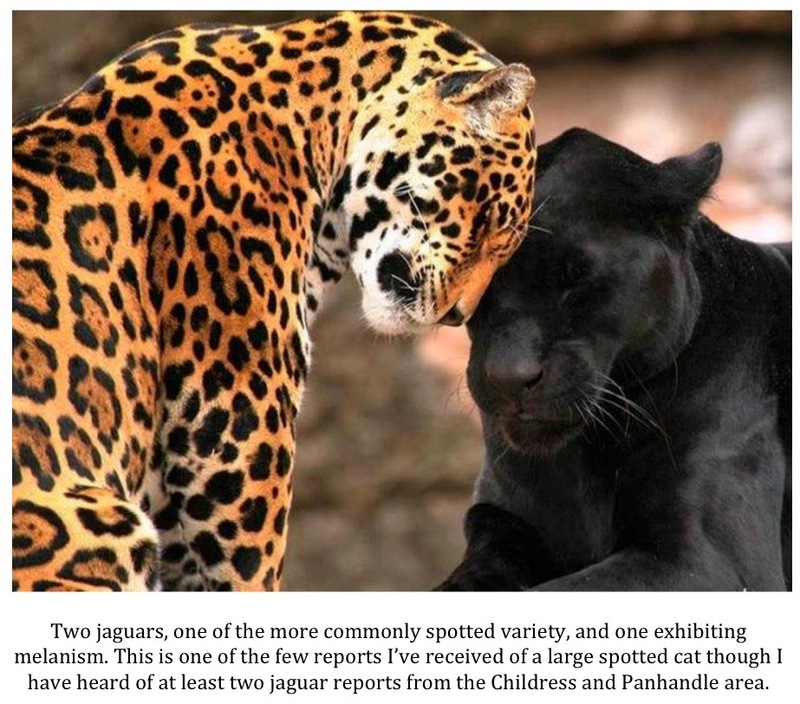 TCH Comments: I found this report extremely compelling as it refers specifically to spotted cats, and jaguars in particular. As has been discussed here before, I don't receive many reports of spotted cats. I will say that the Quanah/Childress area and up into the Panhandle has a bit of a history of jaguar sightings. I haven't talked about it much here but plan on sharing one very interesting account about a jaguar sighting near Pampa, TX here on the site soon. For the reader who submitted this account, please keep a camera handy so that you can get a photo the next time that spotted cat shows its face. "My husband owns a few acres of land in Center Point, TX where he and his friend go hunting. Last week as they were walking to their blinds they heard a loud cat growl but they didn"t see anything. Today my husband was standing by his shed and saw it. It was black, long tailed and the size of our yellow lab who weighs 80 lbs. My husband says he looked like he was hunting jack rabbits. He and his friend will try and see if they can trap him in a large pig cage. The ranch down the road has live stock cows, lambs and goats. My husband said he was a beautiful animal shiny black." TCH Comments: I went back and forth over this report and whether or not I should publish it. The first thing that caused me some doubt was how the witness claims her husband heard a "loud cat growl but they didn't see anything." How did they know it was a cat if they didn't see it? The second thing to give me pause was the statement, "My husband says it looked like it was hunting jack rabbits." What gave the witness this impression? After thinking about it though, I decided that if someone gets growled at by a large animal of some kind and then sees a big cat in that same vicinity shortly thereafter, it is a logical conclusion at which to arrive. The description of the animal is classic "black panther" from the size right down to the shiny coat. 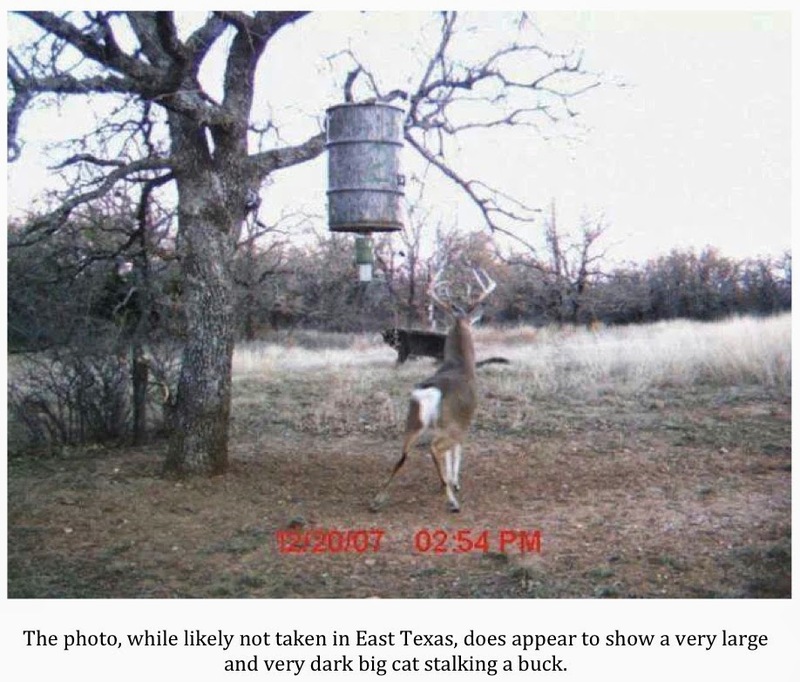 The area from which the report originates is in the Texas Hill Country and is a bit of a hot spot for sightings of long-tailed black cats. For these reasons, I decided to include the report here. If the witness who submitted this report is reading this comment, please do not be offended that I wrestled with whether or not to include your account. I try to be extremely conservative when I evaluate these types of things and it is likely that some valid accounts occasionally get left out. I decided a while back that I'd rather be short a few valid reports than to allow even a couple of those that are more questionable. "I've hunted the vast brush country of South Texas for well over 30 years. I've never seen a Sasquatch, Skunk Ape, Chupacabra or any other so called "cryptid". I've never seen a rattlesnake approaching 7 feet and I've never seen a wild hog much over 300 pounds. I don't watch "Finding Bigfoot" and I don't think there's a "Loch Ness Monster". I don't think that little green men designed the pyramids and I don't believe in ghosts; I have however seen large "black cats" with my own eyes on several occasions." TCH Comments: I love, love, love this statement. This witness just sounds like a Texan. This report, while short on details, perfectly reflects the defiant attitude many rural Texans have about the reality of "black panthers." They are ready to fight when someone tells them there is no such thing. To them, these enigmatic cats are just part of the wildlife that has always been here. I would like to express my gratitude to those that have submitted their sightings of large black cats. Remember, however, if you would like me to follow up with you please submit your account via an email and not as an anonymous comment to another post. Today, fellow NAWAC member Tony Schmidt and I had the privilege of giving a presentation on wood apes to a class of very enthusiastic Gifted and Talented 4th graders at Walnut Springs Elementary in Dripping Springs, Texas. The class is taught by Mrs. Kristi Fout, for whom the group has done presentations in the past (though at a different school district). These kids were on the ball. They were extremely polite and well-mannered and asked a lot of really good questions. Tony spent about 40 minutes alone answering questions with the kids as I was completely snarled in some of the worst traffic I've ever seen (I budgeted two hours and 45 minutes for a 90 mile drive and was still late). He did a terrific job and the kids were primed for the presentation once I finally made it there. 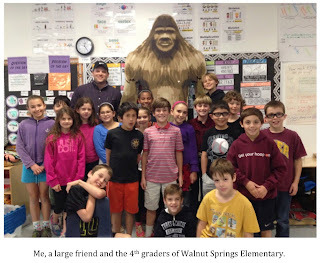 I presented a power point slide show (sort of a wood ape 101), shared some Texas folklore tales, gave the kids a photo op with the large wooden cut out shown in the photo, handed out bookmarks and donated a copy of my bigfoot-themed children's book, Patty: A Sasquatch Story to the Mrs. Fout. Tony and I really enjoyed it and, I think it is safe to say, the kids did too. 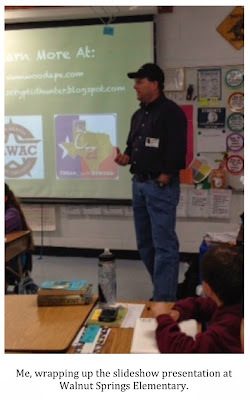 All in all, a very good day for the Texas Cryptid Hunter and the NAWAC in Dripping Springs. If you are interested in having me, or a member of the NAWAC, come out and give a talk on wood apes or another cryptozoological-related subject, please contact me at Texascryptidhunter@yahoo.com. 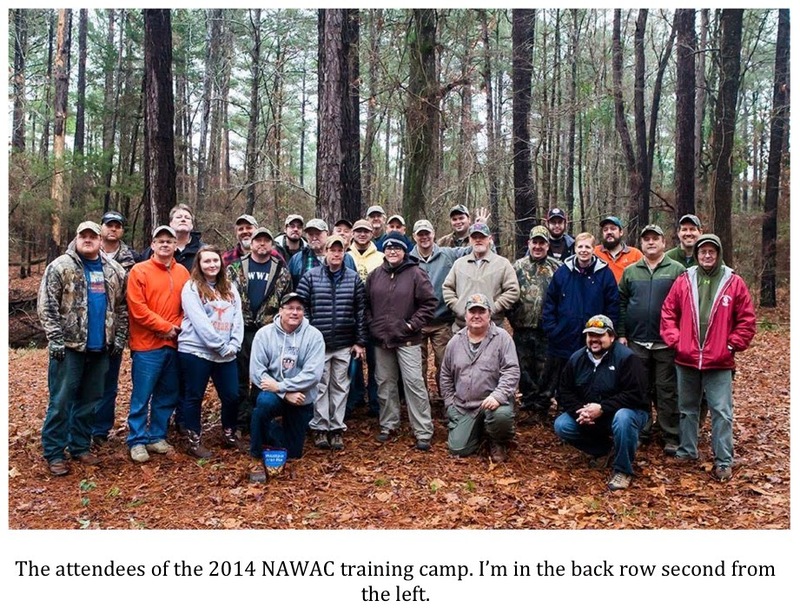 I had the pleasure of spending my last precious days of spring break attending the annual NAWAC training camp, which was held in deep Northeast Texas this year. This yearly event is held to bring new members up to speed on NAWAC policies & procedures, expectations and field protocols. It also presents an opportunity for veteran members to get to know the new folks and vice versa. As you can see, it was a packed two days. I was very encouraged by the quality and enthusiasm of our new members, some of whom traveled to Texas from as far away as New Hampshire and Maryland in order to attend. That, my friends, is commitment. We had a total of about 30 members attend the training camp and feel it was truly a worthwhile event. I look forward to working with all of our new members sometime soon. 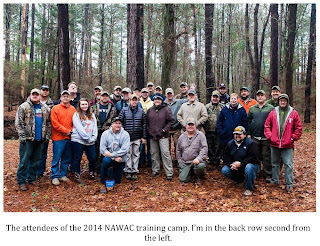 If you are interested in joining the NAWAC and helping us in our efforts to document the North American wood ape, you can visit www.woodape.com and click the “Join the Team” link. Come help us make history. 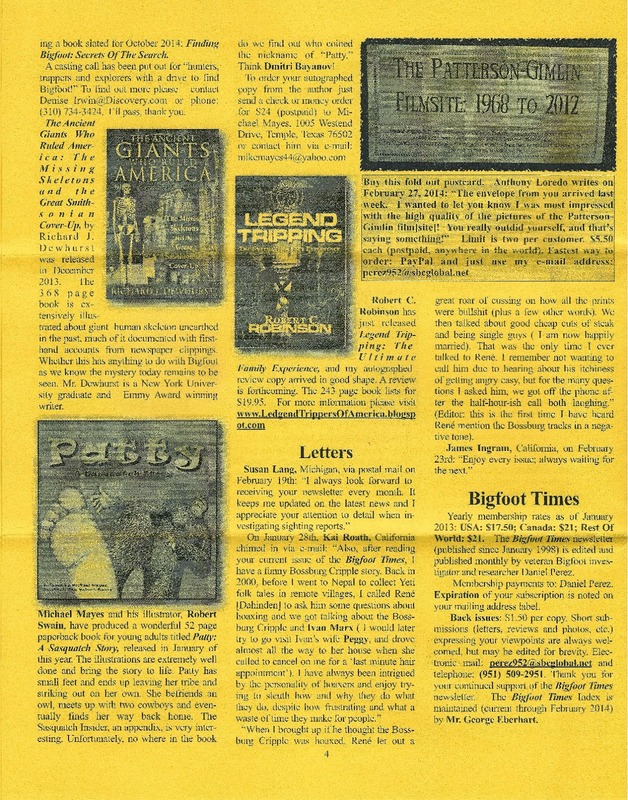 "Bigfoot Times" Reviews "Patty: A Sasquatch Story"
Daniel Perez, editor of the Bigfoot Times, has published a review of my new children’s book, Patty: A Sasquatch Story, in the March edition of the newsletter. Thankfully, he had good things to say. The review is below. "Michael Mayes and his illustrator, Robert Swain, have produced a wonderful 52 page paperback book for young adults titled Patty: A Sasquatch Story, released in January of this year. The illustrations are extremely well done and bring the story to life. Patty has small feet and ends up leaving her tribe and striking out on her own. She befriends an owl, meets up with two cowboys and eventually finds her way home. The Sasquatch Insider, an appendix, is very interesting. Unfortunately, no where in the book do we find out who coined the nickname of “Patty.” Think Dmitri Bayanov!" Daniel’s only criticism of the book was that I did not explain who coined the nickname “Patty.” This is fair and, if I could do it again, would include the fact that Mr. Bayanov came up with it in the "Sasquatch Insider" section. To be fair, I do say that the female sasquatch filmed in 1967 was nicknamed “Patty,” in tribute to Roger Patterson, on the back cover. So, I didn’t skate over this altogether. My reason for not explaining the origin of the name in the book is actually pretty simple. My protagonist needed to already have a name for the beginning of the story. I couldn’t figure out how to name Patty for the cowboy in the story when the tale begins before she ever meets up with him. So, to simplify things, I just gave my young sasquatch the name “Patty” from the beginning. Call it “artistic license,” lol. 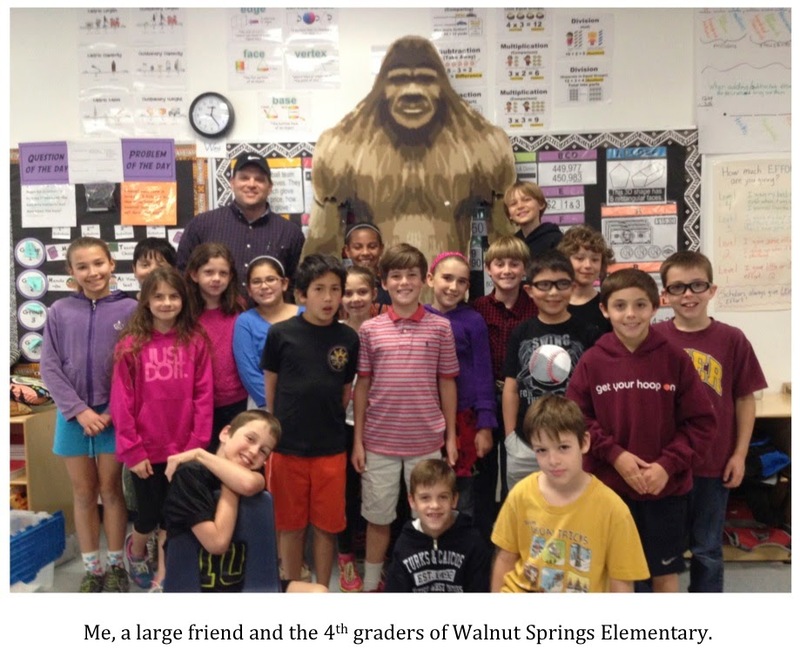 If you would like a copy of the story for yourself, or to donate to your local elementary or city library as part of my “Kids Love Cryptids” reading campaign, just check out all online book sellers (Amazon, Barnes & Noble, etc.). I’d recommend doing a search by the title of the book and shopping around a bit as prices vary day to day and site to site. Electronic versions of the book for the Kindle, Nook and other devices are also available. If you’d like to order an autographed copy directly from me you can contact me directly at mikemayes44@yahoo.com and I’ll get you the details on how to do that. If you do not follow me on Facebook or Twitter, I would like to personally invite you to do so. I post almost daily on both sites as opposed to the 4-5 times a month I post on the blog. On Facebook, I post links to wildlife/cryptid related links and news stories along with a lot of cool photos. Just search for “Texas Cryptid Hunter," look for my logo and hit “like” to stay up on the news or just hit the Facebook link in the right hand margin of this page. I post the same links and stories on Twitter but also post my observations and thoughts on life in general. If anyone is looking to psychoanalyze me then Twitter is the place to be. My Twitter handle is @tcryptidhunter. Hit the Twitter link in the right hand margin of this page and it will take you right to my home page. So, visit both sites as, if you are not following me on them, you are missing out on some pretty cool and fun stuff.